One of the basic necessities in life is and still remains FOOD, lately it has evolved from just food to having a well prepared and well served food and many people just want to walk into a restaurant and be served a well cooked meal. I mean a meal that gives them a run for their money. Food is good, well cooked food is better and a well cooked food, severed in a serene environment with courtesy is best. A great percentage of people love to eat out with a friend, wife, husband, girlfriend, co worker, etc the list goes on but for whatever reason and with whoever they choose to go out with, the base line is that all they want is to eat and that is why we are showing you steps to opening your own restaurant and ways to make your own mark in the food industry. Before you start your restaurant business in Nigeria, you need to a detailed feasibility study and write a business plan. It is always professional for you to have a well laid out business plan and ensure that it is foolproof. Draw out a plan for all the things you want to get done before opening the business, what kind of service do you intend to run, have a detailed description of everything even to the way you expect your staff to dress and carry themselves while going about serving customers. If you want to build, rent or lease a building. Note that this business plan will serve as a guide from the inception stage of this business and will also continue to control how you run your business, you can improve on this plan but it will be your ultimate guide to success. You can Write Or Buy a Detailed Business Plan From Us! Be determined to start this business and also be resilient in seeing this through. Starting a business like this is not a child’s play and you need to be strong hearted to kick off. Keeping your mind on the final outcome of what you want will help to see you through the most difficult times in starting this business. Get all the necessary motivation you need and surround yourself with people that believe your can do it. Learn all you need to know and all you can about the food industry in the country. Research things like what to buy, where to buy them and where to get them at cheaper rates and all these could include any of the following equipments, utensils and food items. It’s important to note that saving all you can right now and at this early stage is so important and will eventually work in your favour. Go around and pay a visit to reputable restaurants around your location that you think may be a major competition for you. See how they run their business; open your eyes you will be shocked how much there is to learn and you will pick up one or two things that will give you an edge to be above them when you start yours. You will have to decide the standard you want to attain and keep in your business. Who are the people in the society you are targeting to service that will be the determinant of a lot of things from here on. Make sure this standard you start with is kept constant if there will be a change then it should get better not worse than when you started out. Maintaining the standard is one of the major things that keeps customers away and ultimately leads to the closure of a business that was well started. Most road side restaurant don’t necessarily need business registration but if you intend to stand out and make your mark you will need a registered name, a trademarked logo and the best location for your business to thrive. The location is very important because the kind of people that live around or work around your business location will determine the kind of people you will attract and how much of them comes to patronize you. Don’t be in a hurry to pick a business location, take your time, drive around and ask questions. Ensure that your business place is very easy to locate, choose the best location with access road, parking space and easily accessible by most of your clients. Now that you have a location, draw up a cost implication of your entire idea that includes your location cost. Are you renting, leasing or building your own business location? All these will tell how much cost implication you will incur as regards cost of start up, equipments, utensils etc should also be included. Raising the capital for the business is an all important phase. Most businesses don’t see the light of day and don’t leave the pages of a book or the minds of inceptors solely because they lacked the capital to carry on from this planning phase. So make sure you kick off and get that capital while your idea is still hot and fresh. Get a loan from family and friends; get a loan from a bank or microfinance bank or raise it yourself but ensure you raise that capital. Get your business location and furnish it with all that is needed before you start, don’t manage. Make sure you are ready before you begin. The purpose of having all these plans for the restaurant is to make great dishes so invest wisely on getting the best hand(s) around to help win the heart of the customers. You may have a great smile but the customers will only come back and pay for a meal if the meal they had the first time is great. And trust me you never can tell how far referrals can work in your favour. Word of mouth goes much faster than even social media adverts. Have an enticing menu that will keep the customers coming and wanting more. Do allot of publicity especially at the initial stage. Go on television and radio if you have to. Print fliers and do social media publicity. You can surely reach a lot of people through media advert. Set a target for yourself and ensure you meet it. It is of utmost importance that your standard is maintain and improved or reviewed constantly. Be known for your quality service and continue to render that service to your customers. Look for new ways to intrigue your customers and appeal to their better judgment to remain in business and gain more money and publicity. A saying CLEANINESS IS NEXT TO GODLINESS should be your watch code or motto. Keep your environment clean to avoid been shut down by the regulatory bodies and to still keep your customers coming and comfortable while they enjoy a well cooked meal. Online presence is very important in this information age. Build an android app which is puts your business out there. This can also help your customers place orders to their homes and offices. Bringing your services to their door step is the best way to ensure a lasting business. Where your restaurant is located and the general customers you intend to attract to your place of business will ultimately affect the class of restaurant you will start up, the things you will have and the general cost for lunching the business. 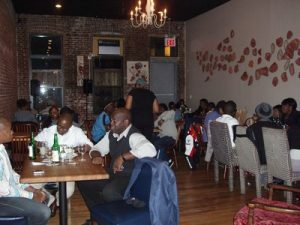 Traditional/Ethnic Restaurants:This restaurant is the kind that serves local or foreign meals which is predominantly cultural base and location based. Some of these restaurants are Chinese restaurants, calabar kitchen, etc. Quick Service Restaurants:These are restaurants that are concerned with just meeting a customer’s need quickly because these set of people are in a hurry and just want to be fed at the moment. This is a quick service restaurant to people that are most likely on break from work or on the move and need to catch a quick meal, but are not interest how they are served they just want to eat. Casual Dinning Restaurants:these are more organized fast food restaurants; they serve their customers in a more relaxed environment. In this kind of restaurant meals are served in no particular order. Fast Food Restaurants:Snacks and drinks are served; these are what we may refer to as junk foods like burgers, drinks, chips and fries, chicken etc. you could have the option to eat in and take away, there could also be delivery service. Fine Dinning Restaurants:These are high class restaurants that serve customers with dignity and respect just as they would get at their homes or even better. These restaurants have standard services and do what with is called courses e.g. three course meal or five course meal. They serve the best of the best in the society, the elites and as we will call them in Nigeria “big boys”. The cost of starting a restaurant cannot be given here in details basically because there are several kinds of restaurants and classes. The location and the quality of service you offer will be the determinant of the starting and running cost. With as low as N1,000,000.00 (one million naira) you can start up something nice but if you intend to go higher, then your cost will increase greatly. Things Needed For Startup of a Standard Restaurant. A lot of these are optional depending on the type /class of restaurant you want to open. Stiff Business Competition:there are several individuals in this business which pose as a major competition to this business. The competition will be stiff, you have to decide to weather the storm and also look for ways to be ahead of every other competitor in the business. Go out to other restaurants and have a meal or two just to learn a few new things that can help you work better. Risk Management/ Loss: running a restaurant could be a difficult and tedious task; early mornings and late night are major characteristics. You have to be careful and cautious because these factors are one of the things that could lead to disasters and hazards in this business. Management Crisis: A lot of individual employ base on sentiments or familiarity but it’s important to note at this time that you have to employ capable hands that can manage this business. Hire creative and innovative people that will take your business from the ground up. Customer Service Complexity: Understanding you customers and their needs is one of the most complex tasks posed to any restaurant owner and this is because a human being has needs and these needs changes from time to time so you have to be up to date with the current need of your customers. Inability to meet with this moving train can hinder growth and ultimately cause the sudden close of this business. KNOW YOUR CUSTOMERS. Get a great and user friendly website and if possible get an android application. Host events, shows and sponsor programs. Constantly make your employees dress smart and corporately. Do publications with testimonials of from satisfied customers. Network with other food vendors. Hurry now and get your own restaurant business plan in Nigeria + feasibility study. After payment, send your name, email address and title of business plan (i.e. restaurant business plan in Nigeria pdf) via text to 07033378184. Your business plan will be sent to your email within 10 minutes after payment. Thank you.